Wicked was spectacular! 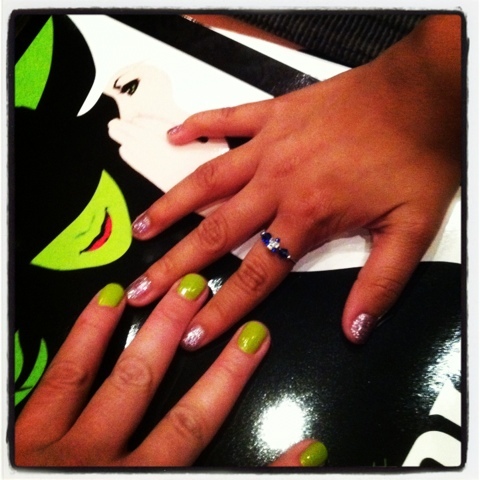 I’m sporting the Elphaba nails and my daughter is representing Glinda. At this point in the evening I could not do the show justice. I am tired and I need to catch up on a night of missed sleep, but still so happy to finally see a play I’ve been wanting to see for years. Even though I read the book and we had the soundtrack memorized going into the play, I was still surprised with that ending and with various other points through the show. This entry was posted in Project 366 and tagged broadway, Instagram, manicures, nails, photograph, project 366, wicked. Bookmark the permalink.